Geller’s attacks on White are worth discussing only in light of their irony. 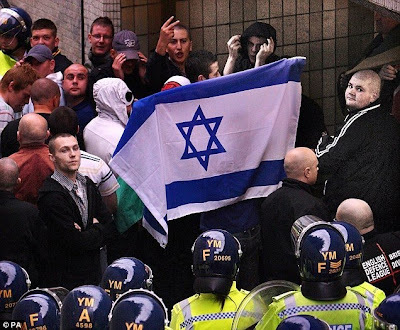 She is, after all, a fervent supporter of a British fascist group comprised of soccer hooligans and skinhead thugs who have delivered sig heil salutes en masse at their rallies while also displaying Israeli flags — a most bizarre melange. Geller’s endorsement of the shadowy fascist group, called the English Defense League, highlights the reorganization of the British far-right around an anti-Muslim, pro-Zionist platform designed to cultivate alliances with influential online fanatics like her. 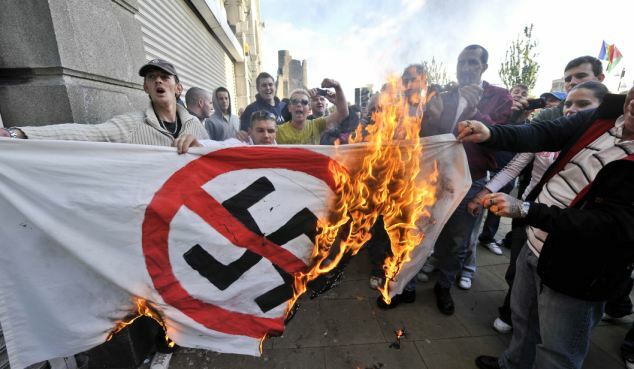 Who belongs to the EDL? The group’s muscle is provided by thugs affiliated with the right-wing football hooligan club, Casuals United. The Casuals are led by an infamous thug who goes by the name “Tommy Robinson” and who will only appear in public in a balaclava. The Casuals are themselves a front for the another violent football hooligan gang called Soul Crew. Soul Crew’s former leader, Jeff Marsh, is now the head of the Welsh Defense League and a recruiter for the Casuals. Independent journalist and filmmaker Max Blumenthal is the New York Times best-selling author of Republican Gomorrah: Inside the Movement that Shattered the Party and a Nation Institute Puffin Foundation Writing Fellow. His work has appeared in The New York Times, The Nation, Salon.com, and Mondoweiss, among other outlets. You can read his blog at maxblumenthal.com, where this post originally appeared. Strange bedfellows! Geller and her ilk ought to know that the far right’s support for Israel is purely a tactical maneuver, rather like Hitler’s temporary alliance with the Soviet Union. Once the “Muslim problem” is solved, the Jews will be next.